Classic, stylish, attractive and extremely convenient; the Capri Rectangle Single Leaf Extension Table will solve any space problems. 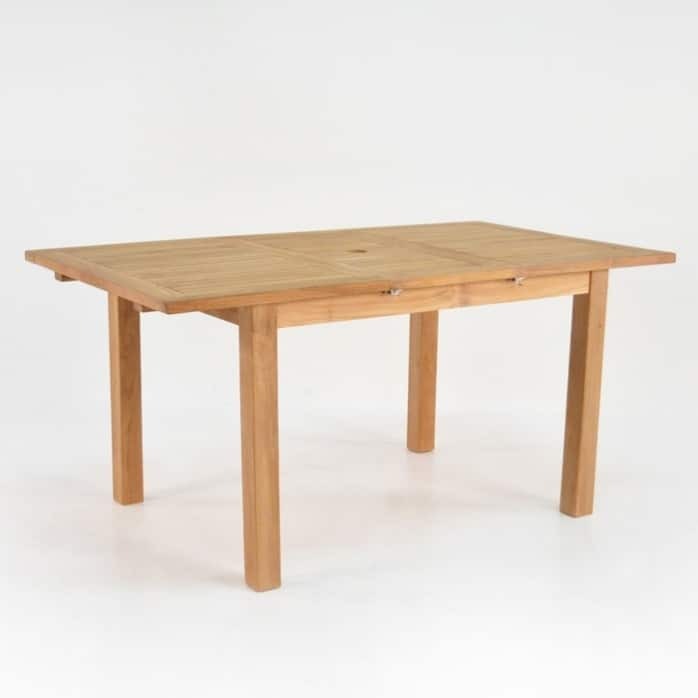 An ideal family extension table; the Capri Rectangle Single Leaf Extension Table is a fantastic table for dinners from 2 to 6 people! Dine outdoors in style with the Capri collection of extending dining tables. A solid frame is met with an elegant tabletop with a butterfly piece that folds into the table. 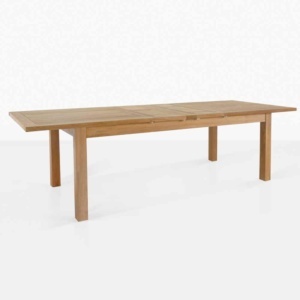 This Capri Rectangle Single Leaf Extension Table is 3cm thick and expands from 1.2 to 1.6 metres and is 90 centimeters wide, so it is absolutely perfect for tricky spaces where a dining set is absolutely needed but can’t be expanded on a constant basis. If you love this style but want to go bigger, look into our Capri Double Extension Tables – all available in both rectangular and oval shapes. The Capri Rectangle Single Leaf Extension Table is made out of beautiful Grade A Teak, famous for its attractive looks and durability. Teak is given an ‘A’ grade once it reaches 40 years old or older. This grade means that it is ready to be made into furniture suitable for outdoors as the teak has generated rubber, oil and natural preservatives. It is for this reason Grade A Teak makes up the vast majority of our products at Design Warehouse. However, we do carry other options of amazing, beautiful marine grade furniture, choose from All Weather Wicker in thick and chunky styles and slim, patterned fibres, Raw Concrete in the funky Blok range or standardized colours, Reclaimed Teak, Batyline® and Textilene® and Stainless Steel. We have all the options to make buying for your outdoor living area a breeze. Design Warehouse doesn’t just carry amazing dining sets and glorious deep seating, we also have a great range of loungers, bar furniture, accessories, pots and planters. Everything for you to feel at home outside of your home! Perhaps your garden is a little simple at the moment, no furniture and you’d like to host dinner parties during the summer, or enjoy a morning coffee outdoors but you don’t have much space. 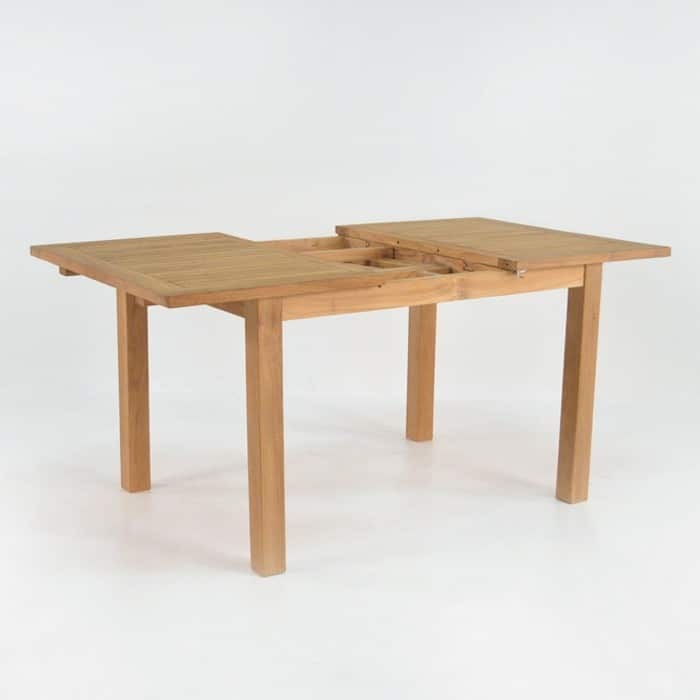 We have an easy fix with the Capri Rectangle Single Leaf Extension Table! Purchase this beautiful table with 6 folding side chairs, most of which to be stored or used in another area until the table is fully extended. 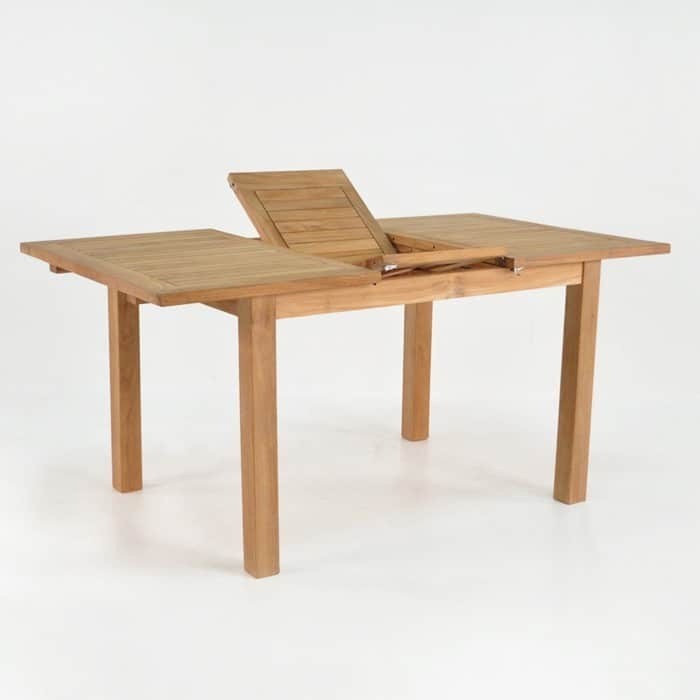 The Capri Rectangle Single Leaf Extension Table accommodates an umbrella when the table is fully extended. Place on a your ocean view veranda fully extended with a 2 metre umbrella shading you and your guests. Perhaps you want a mix of materials, bring in some of our stunning mid century wicker chairs, maybe with a touch of aluminium for a contemporary edge. Having trouble deciding between deep seating or a dining set? Do both! Because this gorgeous table has a small footprint, it can also be part of your outdoor space, giving you the option to relax on your sofa or sectional after a lovely meal. The Capri Rectangle Single Leaf Extension Table is a classic and chic table from Design Warehouse, your number one choice in outdoor furniture.